Haitian journalist and former presidential candidate Clarens Renois says Haiti is in a state of "Non-State", the authority of the State does not exist and Jovenel Moise is ONLY president at the National Palace. Days before a major anti-jovenel protest is announced, Clarens Renois made these declarations to journalist Marie Lucie Bonhomme on Radio Vision 2000. "Jovenel Moise can't even move about the country," Clarens Renois said. "Look what happened to him on 17 October during an official State ceremony." "Haiti is going trough a terrible crisis and we cannot take it lightly," Renois said. The fact that former Senator Moise Jean Charles can freely lower the flag of Haiti and raise his own flag and nothing happens to him is a sign that the State of Haiti is weak, he said, and it it not the fault of President Jovenel Moise. This weakness of the State of Haiti has existed in the country for more than half a century. The weakness of the State? Marie Gaillard Elie, who do you want as President? Do they have any resources to bring progress to the country? I say NO. 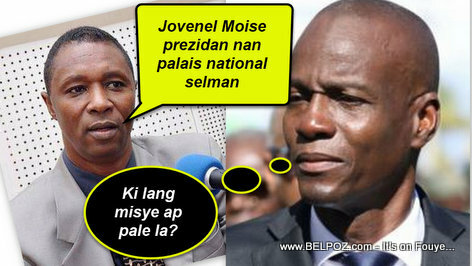 Support President Jovenel Mouse. He is trying hard to do something. He kills so many people why why?